Wear your Angel(s) HALO for everyone to see. Keep their spirit close and spark their memory. 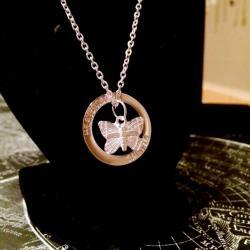 The HALO Necklace by HEAVENSBOOK ANGELS™ is to be worn by anyone who has an Angel in Heaven. The open HALO upon your heart has no beginning and no end, symbolizing the infinite love you share with your Angel. Each HALO Necklace arrives individually gift wrapped inside a sheer organza bag containing the descriptive HEAVENSBOOK HALO Card and a complimentary large white Angel feather. *HALO Charm - 22mm wide Silver plated engraved "HEAVENSBOOK ANGELS"
*Necklace- 18in stainless steel cable link with lobster clasp.